When integrated to google drive, any file submission is usually accompanied by a summary of all details submitted through the form. I was just wondering if there is any way to edit the summary to my preferred format. I believe the Submission settings should suffice your need. 1. You can go to "My Forms"->Choose a form->Click "Submissions"
2. In your Submissions display, you will see the setting icon on the right side, also the edit button. Edit Button: You can edit the form here. 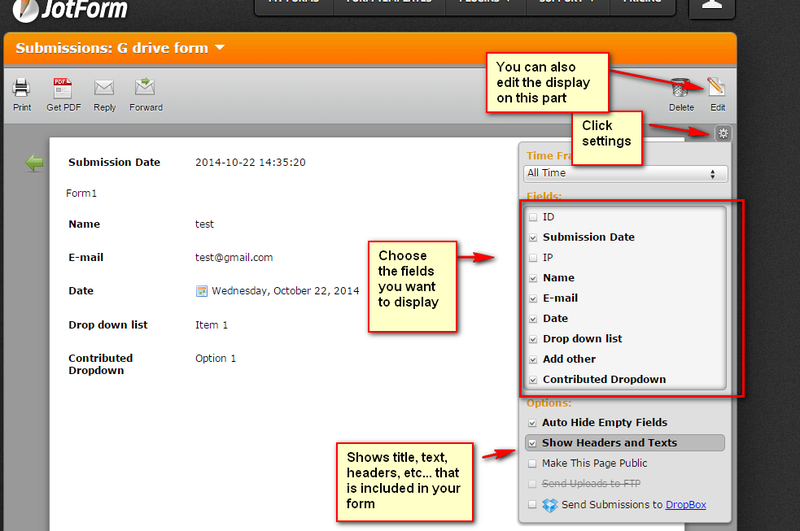 Show Header and Text: It will display the form as it is with field values on them. You can tinker on how you will display the details of your submissions here. Let us know if this helps you. Thanks for showing that to me. using a tool from form creator. I've moved your query to a new thread and shall be addressed there.